The name Giuseppe Arcimboldo means little to most culinary enthusiasts, or “foodies” as many are inclined to refer to them. He was neither a great chef, nor was he an altogether significant contributor to the enduring culinary landscape. Arcimboldo, an Italian painter from the Renaissance era, is probably best known for his manipulations and portraiture with food. More explicitly, Arcimboldo used the representational likeness of various foods to create surreal portraits of those who sat for him. 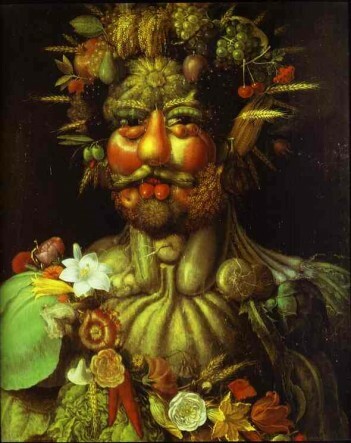 This series of portraits made Arcimboldo quite famous for the time, and set the standard for food-based art. While more and more emphasis is placed upon the artistry of food preparation, and presentation in the restaurant setting, as well in magazines and on competitive food arenas. 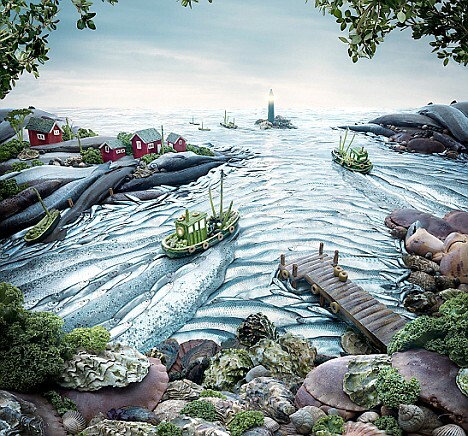 It is enthralling to see artists, as well as just creative types, playing with their food. The following is a minor celebration of these people and their creations. While in no way is this intended to be a comprehensive look at all of the artists working within this medium, it is a tantalizing start. Feel free to add some of your favorites in the comments below. Chinese artist, Song Dong, created “Eating the City” in 2007, which was on display in a London department store before it went stale, or was presumably eaten. 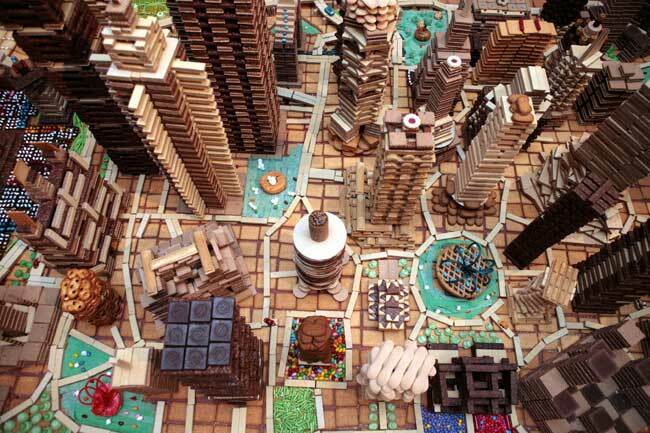 Made entirely of 72,000 biscuits along with tea, caramels and fruit shortcake, Dong created a composite Asian city to scale. Vik Muniz is a Brazilian born visual artist, and has been known to work with chocolate syrup, caviar, diamonds, and various detritus to create incredibly memorable and evocative works. He has done likenesses of the Mona Lisa out of both peanut butter and jelly. 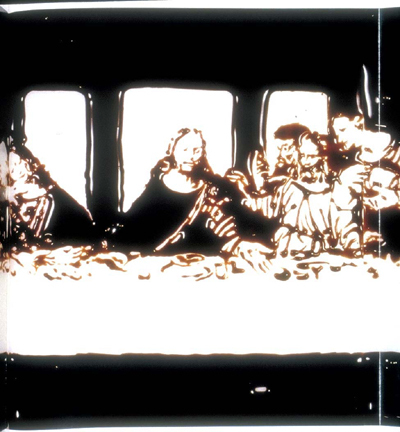 In the piece below, Muniz created a three-paneled depiction of The Last Supper rendered entirely in chocolate syrup. British Photographer Carl Warner feels like almost a direct descendant of Arcimboldo with his exquisitely lush landscapes assembled from various foods. 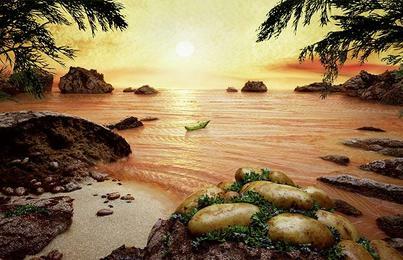 On first glance, they seem like fairly ordinary landscape paintings, but upon closer look the menu items begin to become more clearly identified. You spy an onion, a fish head, and a slice of charcuterie. Then that is where the fun begins. Beautiful! Novel! It must be wonderful to eat a work of art! Thanks for this story. 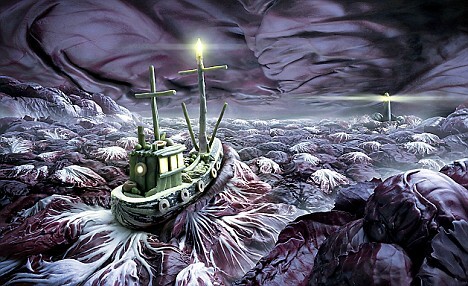 Will look up the works of Vik Muniz and Carl Warner to see their works. Cool! Edible art! I like those edible bouquets, it has all that fresh fruit... it's like fruit salad on a stick, and you can pick out different ones to have on your plate. YUMMY! Sweet, you guys may want to try youtubing coffee art or cappichino art. I don't know how I feel about these. Of course, they're beautiful and creative, but... wasting food...? I guess it's OK if it gets eaten in the end, but I hate to think that these thousand of toasts went into a compost pile after the shooting of the video.